Covering antique terms beginning with the letter ‘F’, everything from faberge to fusee and faience to furstenberg. Below you will find antique related words or antique terms begining with ‘f’ covering everything from faberge to fusee and many more that you might find useful. The list is not exhaustive but we will add to it as time goes by. Russian designer and manager of the faberge workshops that produced meticulously crafted objets de vertu and jewellery. Decorative steel studs cut with facets fashionable in the 18th and 19th centuries. Used for buttons, belts, sword hilts and jewellery. The main production centres being Woodstock near oxford and Mathew boltons factory in Birmingham. The small flat surfaces ground onto cut gemstones. Often to enhance colour by sacrificing brilliance. Also –angular light reflective surfaces in bright cut engraving. 16th and 17th century high quality glass wares made in the Venetian style, mainly in Britain, germany and the Netherlands. Is the name given to french tin-glazed earthenware developed from Italian maiolica. Also – the name used for tin-glazed products from germany and Scandinavia. Delftware is the british version of faience ware and delft the dutch version. Faience was first produced in france in the 16thC by italian craftsmen from the town of faenza in italy. Early designs emulated Chinese porcelain. Also – faience blanche produced and used in the 17th and 18th centuries and developed for everyday use. Also – faience fine, the French version of british creamware introduced in 1768, it is usually lead glazed rather than tin-glazed. 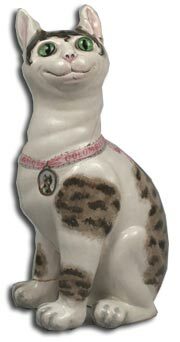 Cheaply produced porcelain animal or human figures made for sale or as prizes at fairgrounds form 1860 to 1914. Often comical in theme, with risque captions beneath. Fairings made from 1860-1890 in germany and Austria were produced in moulds and have solid bases. From 1890 to 1914 hollow imitations were mass produced. High quality lustre ware decorated with fairyland scenes by daisy makeig jones and registered by the wedgwood factory in 1915. Fairy land lustre was marketed throughout the 1920’s and into the 30’s and is highly collectable and sought after today. A genuine object altered in some way to represent something else, not necessarily to deceive. The hinged lid on a desk bureau or secretaire that folds down to form a writing surface, often supported by pull-out lopers. It is also know as a drop-front. A french term referring to families or palettes of enamel colour used on Chinese porcelain. Famille verte, introduced in the mid-17thC is dominated by green (and contains yellow, aubergine, black and blue), it was largely replaced by famille rose around 1720. Famille noire is famille verte with the background filled in black and famille jaune has a yellow ground. Famille noire and juan are often painted onto an unglazed bisque body. An accessory for women especially in 18thC Europe, used to generate a breeze and to communicate modesty, coyness or for discrete flirting. The rigid fans of the ancient civilisations and renaissance Europe have a long handle topped by a leaf of parchment, fabric or feathers within a rigid frame. Folding fans originated in china and came to europe with the Portuguese in the 15thC. Ribs of bone or similar material are covered with a pleated semi-circular leaf of paper, silk or lace. Also — Brise fans made entirely of overlapping ribs of ivory, mother of pearl or bone with a ribbon threaded through the upper ends (brise is French for folding). Also — cockade fan which can be pleated or brise but opens out into a complete circle. A type of pocket watch that was mass produced in Britain in the first half of the 19thC. The dial is usually decorated with a painted rural scene. Large versions are sometimes referred to as turnip watches. A quarter of an old pre-decimal penny. Issued in silver in the 13thC; in copper from 1672; in bronze from 1860 to 1956. Farthings ceased to be legal tender in 1961. The french term for a secondary wood such as beech painted to simulate an exotic wood such as rosewood; an effect used in the early 19thC. An 18th or early 19thC pill or patch box in the form of a dummy watch, from the French term meaning false watch. Some are made of bilston enamel. Trade name for a type of iridescent art glass developed by the US designer louis comfort tiffany c1892. It was made in a variety of colours and the oil on water effect was created by spraying the hot glass with metallic salts or by applying acid or metallic lustres to a cooled surface. It was mainly used for vases as the one pictured. Engraved or bright-cut patterns of fine, slanting lines that decorate the edge of silverware. Feather-edging was used on flatware c. 1760-90 and on the handles of silver cutlery from the late 18thC onwards. A tough form of bone china which contains pure feldspar in place of Cornish china stone, which is only part feldspar. The first successful feldspar body was produced at coalport, but spode was the first to name the body and mark pieces feldspar porcelain c1820. The idea was soon taken up by other Staffordshire potters. A low screen or rail of cast iron, copper, brass or steel designed to stop coals rolling out of the hearth. Fenders were introduced in the late 17thC when raised baskets or grates lifted the fire off the ground. They may be movable pieces or a continuation of the fixed fire surround. A fender curb is a shallow version used on a broad, deep hearth. Club fenders or seat curbs are combined fender and padded seat connected by metal bars. English term for hinaningyo – extravagantly dressed Japanese dolls made for doll festivals at which Japanese boys and girls were ceremoniously initiated into traditional customs. The dolls were traditionally handed down from generation to generation. A flat, raised panel in a wall or a piece of furniture with bevelled edges. The markings, grain or pattern on a piece of wood. Also – A figured textile is one with a pattern of figures or naturalistic subjects as opposed to one that is plain or striped. Also – Human or animal form. Netting with a pattern or design embroidered into it to create a lace effect, popular 16th to early 17thC and late 19th to early 20thC. It is also known as lacis or darned netting. Lace-like decoration made with fine gold or silver wire. It was widely used in Europe from the late 17thC on jewellery and for openwork panels set in boxes, baskets and cups. Birmingham was a manufacturing centre in the 18th and early 19th centuries but thereafter much filigree came from Malta, India and China. A small ledge supporting a shelf. Also – A small, narrow band found on architectural features in furniture, such as on a fluted column. Also – A leatherworking wheel tool used in bookbinding to make straight or parallel straight lines. The term can also refer to the line itself. An Indian sword with a straight, strengthened blade for use with both hands. The blade was often imported from Europe, hence the name firangi, or ‘foreigner’. The bright flashes of coloured light displayed by a gemstone resulting from its high refractive index and strong dispersion of light. The fire of a stone is improved by faceting. There is more fire in a correctly faceted diamond than in any other natural colourless gemstone – emeralds and rubies have brilliance, not fire. Collective name for a matching set of tools for stoking and cleaning a domestic fire, including tongs, poker, shovel, brush, sometimes a fork, and before the use of coal, a hook for handling logs. 18thC fire irons were usually of polished iron or steel and tended to be larger than later versions. Twisted handles were popular in the 1790s. In the 19thC, fire irons were mainly made in brass. Technique applied to pressed glass to give it greater brilliance. Moulded objects are heated at the mouth of the furnace to remove the dullness sometimes imparted from the trace elements in the iron mould. Cast-iron panel at the back of a fireplace to retain and radiate heat, to protect the adjacent wall and for decoration. Firebacks are also sometimes known as fireplates, iron chimneys and reredos. The process of baking ceramics in a kiln. An initial or biscuit firing causes a chemical change to take place in the clay paste, binding the particles to form a hard, rock-like body. Firing temperatures vary for different ceramics: up to 800°C (1450°F) for earthenware; 1200-1450°C (2200-2650°F) for stoneware; 1100-1200°C (2000-2200°F) for soft-paste porcelain; and over 1400°C (2550°F) for hard-paste porcelain. Subsequent firings may fuse the glaze or enamel colours onto the body. British sculptor, painter and silversmith who specialised in enamelling. He invented a widely copied technique that created an illusion of depth in translucent enamel by using a foil background. Much of his silverwork features celtic motifs. Chinese export porcelain with a trellis border in underglaze blue or overglaze iron red, and inner flower clusters, thought to be named after a family who commissioned the design. It was copied by various English factories. A cheap, serviceable mercury stick barometer which was mass-produced from c1870. It includes printed paper weather-forecasting charts based on Fitzroy’s Rules’ which were introduced on earlier marine barometers designed by Admiral Robert Fitzroy. Fitzroy barometers were made in variously styled cases, and typically also included a thermometer, and a storm gauge. Large vessels for serving wine or beer, like large-scale tankards, which were made throughout Europe, generally in pairs. Flagons have a flat bottom, slightly tapering sides and a handle and thumbpiece, often with a hinged lid. They were rare before the 17thC and usually made of ornate silver, to hold Communion wine. Towards the end of the 17thC their use increased in taverns and households. The French for ‘flamed’, referring to a lustrous, rich crimson-red ceramics glaze with flashes of brilliant blue. The effect was produced by firing a copper glaze in a reducing atmosphere – one that removes oxygen from the glaze. The technique was used on Chinese porcelain of the late 17th and 18th centuries, and rediscovered and widely applied in Europe in the late 19thC. Doll’s neck with a ridged base used to secure a bisque, china or composition head to a cloth body. Glass objects dipped into molten glass to give them a fine outer layer, thinner than on cased glass, which is often in a contrasting colour. The flashing may be cut or ground away in a pattern to expose the layer underneath. Stoppered glass, ceramic or silver container for holding liquids, often alcohol. Those for table use generally have a bulbous body and a short neck. Small flasks for carrying on the person tend to be flattened ovoids in shape, and also called pocket bottles or spirit flasks. Pottery figures designed to be viewed from the front only, with flat, unmodelled and undecorated backs. They were intended as decorations for cottage mantelpieces and produced mainly in the 19thC by staffordshire potteries. The figures were easily reproduced in moulds, decorated in underglaze blue, and embellished over the glaze with bright enamel colours. Later models have a more limited colour range, some in black and white with gilding. Late 20thC reproductions made from the original moulds abound. In silverware, the term strictly refers to articles of tableware made from a flat sheet without a cutting edge, such as spoons, forks, sifters and sheers, although in modern usage the term also includes knives. The term also refers to other objects of flattened form, such as plates, saucers, shallow dishes and salvers, as opposed to cups, bowls and tureens (hollow-ware). Generic term for any form of carpet or rug with a flat, tapestry-like weave with no pile, including the kilim and sumakh. British neoclassical sculptor and artist who designed and modelled for wedgwood, producing friezes and portrait medallions, from 1775. In the late 18thC he worked mainly as a marble sculptor and also produced models for silver for Paul storr. Type of glass decorated with random coloured specks. The technique, originally developed by the Romans in the 1stC ad, involves rolling a gather of molten glass over broken chips of glasson a marver, and then blowing it. Flecked ware is often called nailsea glass, but it was also made at many other factories. Flecked glass was used to make jugs, flasks and novelty items such as rolling pins.. Type of ignition mechanism on a firearm used from the early 17thC until the early 19thC. Sparks were generated by friction between a piece of flint and a steel plate, the frizzen. Below the frizzen is a pan set next to a touch-hole in the breech. The sparks ignited powder in the pan and, via the touch-hole, fired the main charge in the breech. Paper or cloth used as wall covering, with a stencilled design picked out in glued-on powdered wool to give a contrasting velvety texture. Flock was first used in France and Britain in the early 17thC and was very fashionable in the 18thC. Originally, a gold coin issued in Florence in the 13thC. In Britain, a silver florin – face value 10p (2s) – was first issued in 1849. The word ‘florin’ no longer appeared on these coins after 1936, although the denomination still exists in the form of the modern lop piece. Term used to describe the fuzzy and blurred cobalt-blue transfer prints on Staffordshire earthenware of the 1860s to 90s. Table or stand specifically designed for holding plants or cut flowers. Some have inset, wire-covered trays which were filled with wet sand to hold cut flowers. Brick-shaped container with holes pierced in the top for cut flower stems. delftware versions were popular in the 18thC. Larger, semicircular vessels with separate flower-holders are called bough-pots. Tall, stemmed drinking glass for wine with a slender bowl which flares out or narrows at the rim. Flute glasses were particularly popular 1773-1850. See ratafia. Semicircular parallel grooves which run vertically up a column. A substance added to a glass or ceramic body that lowers the temperature at which the fusion or melting of base materials takes place during firing or smelting. Potash, bone-ash, borax, lime and soda are common flux materials. A decoration of knots and bunches of floss silk – popular on 18thC dresses and christening gowns. Parts of a drop-leaf extending table: the fly or drop leaf of which is supported by a hinged fly bracket or rail. 18thC term describing the chain used to secure a small pocket watch. The term originated from the fob pocket (in the waistband of men’s breeches), and the word fob came to refer to any small ornament attached to a fob chain, such as a fob seal. In the late 19thC, ladies’ ornamental watches suspended from a brooch on a short chain or strap were known as fob watches. The watch face was sometimes displayed upside-down so it could be read easily by the wearer. Staffordshire pottery founded 1860 and initially operated by Wileman & Co. The pottery was known for its simple, bold designs and brightly coloured decoration. The firm was renamed Shelley Potteries in 1925 and from the 1930s became a leading producer of art deco china, and children’s crockery. Tea sets and dinner services are notable for their distinctive shapes, and floral, geometric and banded patterns – many by leading British artists such as Vanessa Bell, Duncan Grant, Laura knight and Graham Sutherland. The inverted cone-shaped cups and sharp triangular handles of the ‘Mode’ range and the square plates of ‘Vogue’ are typical. A cabinet-making term referring to leaf-shaped ornament. French interior decorator and early art deco designer of furniture, textiles, carpets and metalwork. His furniture is finely made with expensive materials such as ivory and shagreen. Early examples showed an art nouveau influence in their curving lines, and c1929 came a more geometric, Art Deco style. French architect-designer team who were mainly responsible for establishing the empire style of the late 18th and early 19th centuries. Pierre-François-Leonard Fontaine (1762-1853) and Charles Percier (1764-1838) were employed by the Emperor Napoleon to provide an interior-design style that reflected his life and empire. They designed furniture, silverware, textiles and were the first to coin the term ‘interior decoration’. Slightly projecting rim on the base of an object, also called a foot-ring or basal rim. Portable container of hot coals or water, used throughout northern Europe to keep feet warm. Most foot-warmers consist of an inner container made of stoneware or metal with a perforated outer case of wood, wrought iron, copper or brass, and were sometimes wrapped in carpet. A deliberate attempt at deception. See antique fakes and forgeries. Watch made in the form of another object. Early examples of the 17thC were intended as a memento mori (reminder of death), often in the form of a cross or a skull. 19thC revivals included stringed instruments, shells and flower heads. French jewellery designer who specialised in enamelling and was inspired by renaissance designs. Many of his designs are carved onto precious stones. His son Georges (1862-1957) joined the firm in 1881 and took it over in 1895, designing pieces in art nouveau style. Brownish-yellow spots or stains, or other discoloration on paper, a form of fungal growth caused by damp. Finnish designer who did much to bring modern Scandinavian design to international status during the 1950s and 60s. He was an independent designer of lighting, furniture and textiles, noted for his disciplined functionalism, and was artistic director of Finland’s leading ceramics factory Arabia, 1946-78. German porcelain factory founded 1755 which produced a type of hard-paste porcelain with a glaze able to absorb enamel colours. Frankenthal produced tablewares in the style of meissen and sevres. Figures and statuettes in various styles including commedia dell’arte and chinoiserie were a speciality. The factory closed in 1799. Glass-making process in which the glass is shaped in its molten state by blowing air through a blowing iron without the use of a mould. Form of lacquer used on furniture consisting of shellac dissolved in a solvent giving a harder, shinier finish than beeswax. It was introduced late 18thC and became popular in the early 19thC. Geometric, trellis-like pattern of intersecting vertical and horizontal lines repeated to form a continuous band. Also – The technique of cutting thin pieces of wood with a fine-bladed saw (fret saw) to form shapes or patterns. The fretwork pattern might be left open, as on table galleries, or blind, in which the fretwork is carved upon or applied to a solid surface and cannot be seen through. It is sometimes seen backed by fabric such as pleated silk, as on a decorative panel on a door or a cupboard. An ornamented, horizontal band of painted or sculptured decoration. Also – The horizontal band beneath the cornice of a bookcase or cabinet. A convex horizontal band beneath a cornice is known as a cushion frieze. A frieze rail is the horizontal length of wood beneath the top of a table or desk stand, and is also known as a curtain piece. Unique novelty glassware items such as bells, pipes or toys made by glass-makers, not for use, but to demonstrate their skills. Powdered glass which is melted, allowed to solidify and then re-ground and used as a fusible substance in the manufacture of soft-paste porcelain. Also – The ingredients that are mixed and fired to make glass. Large Flemish family of clock-makers working in London in the 17th and early 18th centuries. In 1658-9 John Fromanteel visited Holland to learn the art of pendulum clock-making. The family proceeded to make the first pendulum clocks for the London market c1659. Decorative effect on silverware produced by acid treatment. All commercial silver contains a proportion of copper. If the article is heated and dipped into a suitable acid, the copper component is eaten away, leaving a textured surface. This process was used to decorate silver articles in the 19thC, especially as a background for highly polished decoration on silver or silver gilt. A doll cast or modelled as a single complete piece. Frozen Charlottes were usually made of glazed porcelain and were also known as solid chinas. They were produced from the mid- 19thC to c. 1910. Some have a flesh-coloured china face and neck and a white china body. celluloid versions appeared from the early 20thC. Long, rectangular Japanese lacquer box designed for carrying letters or messages. A vessel often with three or more small cups and interlinked handles. It was offered in jest as a challenge to drink from one cup without spilling the contents of the others. Fuddling cups were made in tin-glazed earthenware, specially in the West Country, in the 17th and 18th centuries. The London site where the first large, Turkish-knotted woollen carpets were made in Britain. Founded in 1750 by a Frenchman, Pierre Parisot, with the expertise of two savonnerie weavers. The high prices charged for the carpets forced the factory’s closure in 1755, but the techniques were adopted by Thomas Whitty, founder of the axminster Carpet Manufactory. Groove in a blade of a sword or dagger designed to strengthen and lighten the blade. The result of exposing new pieces of oak to ammonia solution to give them an appearance of age. The wood turns grey before fading to yellow-brown. The technique was popular in the 1930s and 40s and was used by the British designer Sir ambrose heal. Small Bavarian porcelain factory founded 1747 which produced hard-paste porcelain from 1753. Early wares include Rococo-style vases and tableware in rich colours and gold, painted with landscapes, birds or figures. From 1770 the factory was influenced by berlin and sÈvres and produced busts, statues and painted wall plaques with ornamental Rococo frames. From c1790 Furstenburg followed the neoclassical style and later the empire style products of Sèvres. Coned-shaped device in clocks to even out the decreasing force of a going spring on unwinding. The device was invented c1500, used to the late 17thC in continental clocks and to c1750 in continental watches. In Britain its use in clocks and watches continued until c1880-1900. A lightweight musket with a flintlock mechanism used in the 17th and 18th centuries.